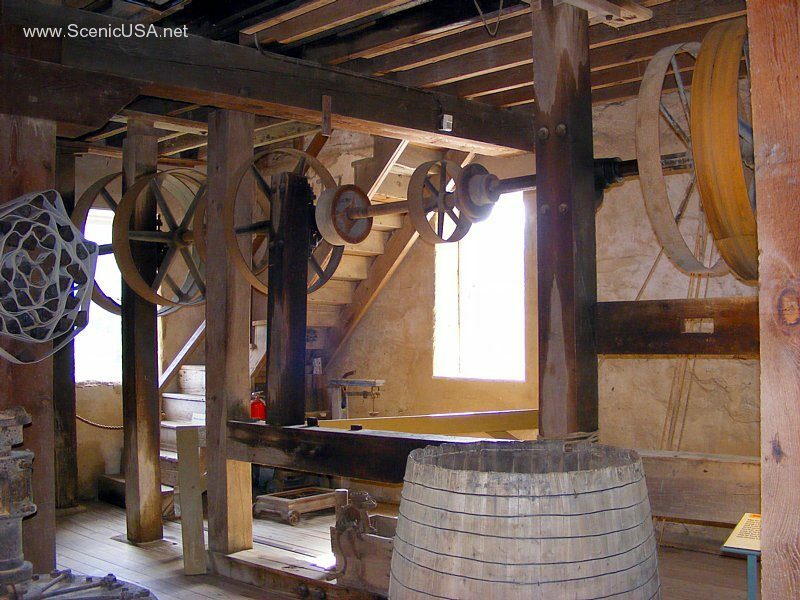 If you are intrigued by the mystique and lore of simpler times, then relive the days of yesteryear by a visit to Bollinger Mill State Historic Site. The 19th-century mill and its neighboring covered bridge offer a glimpse of now-rare Americana that once might have been expected around many turns in a Missouri road. 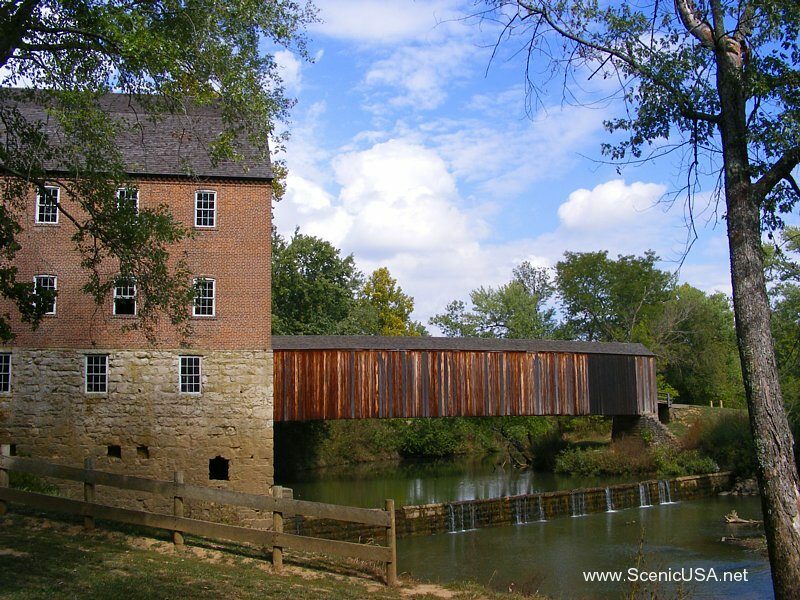 The present mill, dating to the Civil War period, is a massive four-story stone and brick building where visitors can still observe corn being ground into meal by water power - just as it was done long ago. The succession of three mills that have stood on this site represent more than 200 years of milling history. The Burfordville Covered Bridge standing alongside stretches its 140-foot span across the Whitewater River, which powers the mill. Begun in 1858, it is the oldest of only four remaining covered bridges in Missouri. 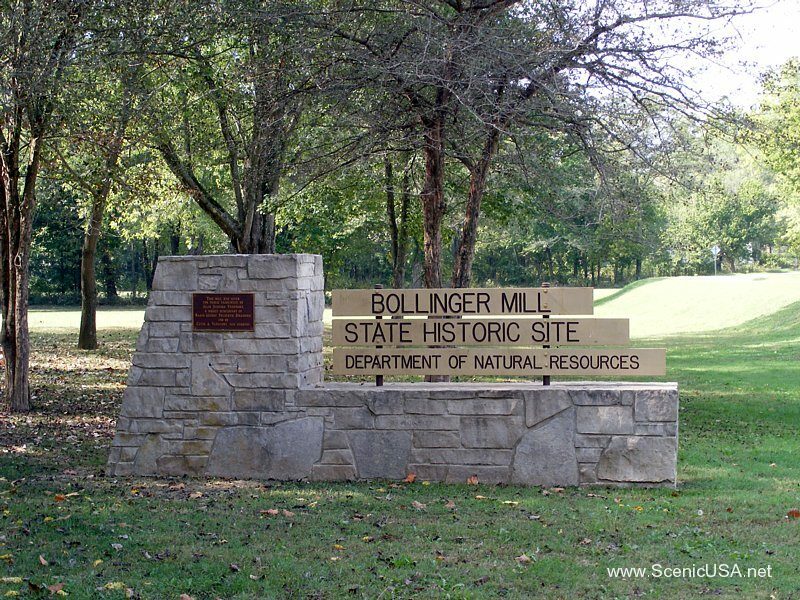 Whether you tour the mill, enjoy an outdoor lunch in the picnic grounds, or laze away an afternoon relaxing in the shadow of these two National Register of Historic Places structures, a visit to Bollinger Mill State Historic Site will be a pleasant reminder of a by-gone era. During the winter of 2000, new exhibits and lighting were installed throughout the mill. The exhibits tell visitors how the process of milling has changed over the years and how those changes affected the mill. The exhibits are designed to withstand the temperature and humidity extremes in the mill and even the flooding that sometimes affects the first floor. From March through November, tours are given on demand during the hours of 10 a.m. to 4 p.m. Monday through Saturday and 12 p.m. to 4 p.m. on Sunday. From December through February, tours are given on demand during the hours of 10 a.m. to 4 p.m. Tuesday through Saturday. 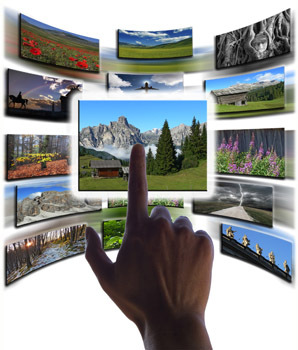 Special events are held which reflect the heritage of the past. The Mississippi River Valley Scenic Drive takes place in April. The mill becomes the site for music, restored farm equipment and special tours. The bridge is open for vehicular traffic that weekend. There are two special folk music concerts held in June and September, and a Halloween storytelling around a bonfire takes place in October. From St. Louis : Trail of Tears State Park is approximately two to two and one-half hours from the St. Louis area. Travel south on I-55 to Exit 105 (Fruitland/Jackson). Take Hwy. 61 north for approximately one mile. Turn right onto Hwy. 177 and continue for seven miles. At the four-way stop in front of the Proctor and Gamble Plant, turn right to stay on Hwy. 177. Continue on Hwy. 177 for another 2.8 miles. The entrance to the state park will be on the left right before the Hwy. 177/Route V intersection. From Jefferson City : Trail of Tears State Park is approximately four hours from the Jefferson City area. Travel east on U.S. Hwy. 50 until it ends at I-44 (just past Union). Take I-44 east to Hwy. 141; proceed south to I-55. Take I-55 south Exit 105 (Fruitland/Jackson). Travel north on Hwy. 61 for approximately one mile. Turn right onto Hwy. 177 and continue for seven miles. At the four-way stop in front of the Proctor and Gamble Plant, turn right to stay on Hwy. 177. Continue on Hwy. 177 for another 2.8 miles. The entrance to the state park will be on the left right before the Hwy. 177/Route V intersection. From Springfield/Joplin : Trail of Tears State Park is approximately five hours from the Springfield area. Travel east on I-44 to U.S. Hwy. 65. 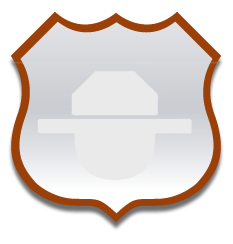 Take U.S. Hwy. 64 south to U.S. Hwy. 60. Travel east on U.S. Hwy. 60 to I-55 near Miner. Take I-55 north to Exit 105 (Fruitland/Jackson). Travel north on Hwy. 61 for approximately one mile. Turn right onto Hwy. 177 and continue for seven miles. At the four-way stop in front of the Proctor and Gamble Plant, turn right to stay on Hwy. 177. Continue on Hwy. 177 for another 2.8 miles. The entrance to the state park will be on the left right before the Hwy. 177/Route V intersection. From Carbondale, Ill. : Trail of Tears State Park is approximately 2 hours 15 minutes from Carbondale, Ill. Travel south on U.S. Hwy. 51 to IL 146. Stay on IL 146 as it becomes Hwy. 34/74. Turn right onto Hwy. 177 and continue for 12.3 miles. At the stop sign at the junction of Hwy. 177 and Route V, turn right to stay on Hwy. 177. The entrance to the state park will be on the right almost immediately after turning onto Hwy. 177. From Memphis, HTTC [;doer Trail of Tears State Park is approximately three and one-half hours from Memphis. Travel west on I-40 to I-55. Take Exit 277 toward Blytheville/Jonesboro and merge onto I-55 heading north. Continue on I-55 for 170 miles to Exit 105 (Fruitland/Jackson). Travel north on Hwy. 61 for approximately one mile. Turn right onto Hwy. 177 and continue for seven miles. At the four-way stop in front of the Proctor and Gamble Plant, turn right to stay on Hwy. 177. Continue on Hwy. 177 for another 2.8 miles. The entrance to the state park will be on the left right before the Hwy. 177/Route V intersection. Doc's Lakeside Cabin was built in 2012 and is located in beautiful Southern Illinois. Let us welcome you to setting where you can rejuvenate your mind, body and soul. Travel south on I-55 to Exit 99 (Cape Girardeau/Jackson). At the bottom of the exit ramp, turn right toward Jackson. Travel 7.4 miles, through Jackson, leaving the west end of town on Hwy. 34/Hwy. 72. Turn left onto Hwy. 34 and continue five miles to Route OO where you will turn left. Travel .4 mile through the town of Burfordville to the historic site. Route OO becomes Route HH in Burfordville; do not take Route OO out of town before you reach the mill.